On March 22nd, Ofcom* published data of their most recent complaints data includng mobile services. Orange came up as the most complained network with 3UK a close 2nd. 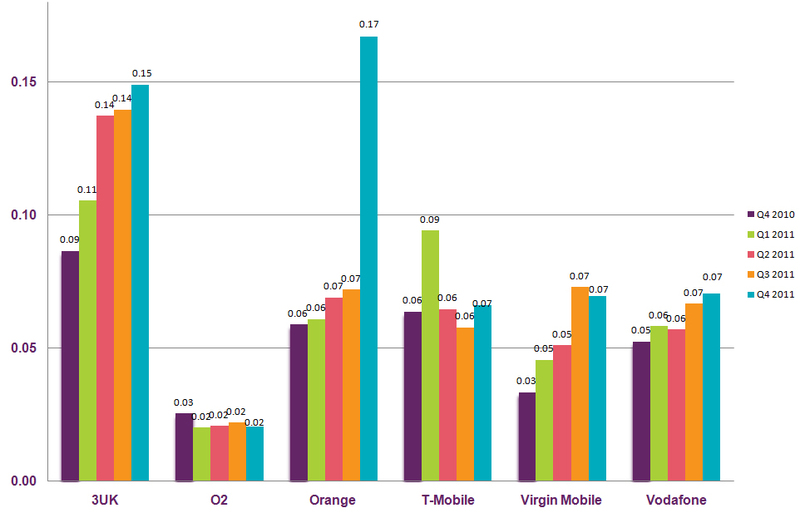 As you can see from the chart provided by Ofcom, although Three only came second to Orange in more recent months, their overal performance is still worse than other mobile networks with O2 having the best performance. They state that Three's high complaints ratio has been driven by the complaints about disputed charges and their customer services. *Ofcom is the UK's telecommunications regulator. I purchased a second hand iphone 4 which is open to Network 3. I would like to open the iphone to all networks, as my wife needs it to travel to another country and use a different sim card there. I contact network 3 and asked them to unlock my iphone and they requested a proof of purchase. I e-mail a proof of purchase to proofs@3mail.com. I received not confirmation or reply. I contacted network 3 and they told the proof of purchase is not accepted as it is in a written format. I e-mail another copy of the digital format (the format requested was Word document). I called again to find out they were unable to open the document because it has an extension .docx (Microsoft Word 2010 format). I e-mail a jpeg photo of the proof of purchase receipt and also said they could not open it. I now e-mailed them another document. It seems I going in circles and going nowhere. If 3 netork would require the original proof of purchase, they have an obligation to contact the orignal customer who is on their records and get the permission.